Unitron is a Canadian hearing aid manufacturer, founded in 1964 in the Waterloo region of Ontario, known as “Canada’s Silicon Valley.” Unitron has grown to be a leading worldwide brand under parent company Sonova Group, with 20 international offices and distribution in 45 countries around the world. With research and development based on collection from clients and hearing industry professionals, Unitron crafts instruments with precision and innovation. Unitron is also committed to supporting community efforts to raise awareness about hearing loss, collaborating with organizations such as the Global Foundation for Children with Hearing Loss and the Hear the World Foundation. They launched the What’s Your Favorite Sound? initiative to remove taboo around hearing loss. Rechargeable Hearing Aids: Charge every night for a full day of listening. Introducing: Moxi Fit R. After just 5-7 hours of charging they’re ready to perform for a full 24 hours. Simply pull the rechargeables out and put them on. All of Unitron’s rechargeable solutions are powered by Tempus, the newest platform that is the best in conversations. Tempus is Unitron’s newest platform aimed to help patients solve their biggest complaints around conversations. The extremely high performance of Tempus conquers the listening environments that patients find the most challenging – conversations in noise and crowds. 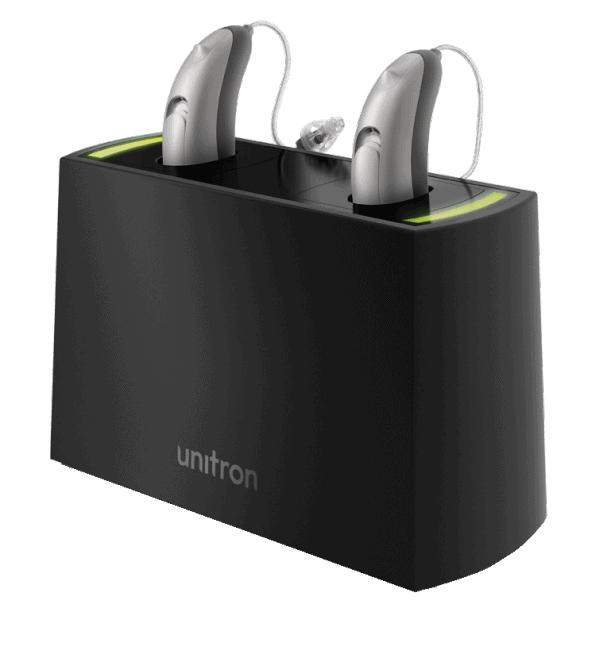 Unitron’s newest processing platform is North, which provides Unitron hearing aids with improved sound quality and flexibility. 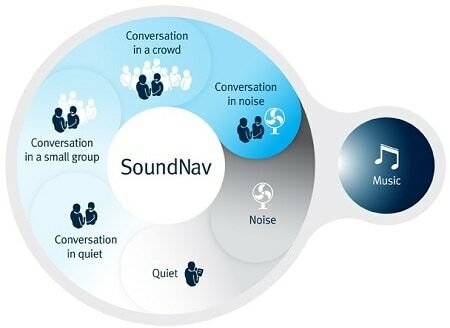 With SoundNav, North adapts to many different sound environments, with various classifications of sound. In addition to environmental sound, North provides excellent speech recognition features, with four channels devoted specifically to conversation: conversation in quiet, in a small group, in a crowd, and in noise. North’s Speech Zone 2 and Sound Conductor work together to make automatic adjustments, focusing microphones to capture speakers’ voices and sounds in a variety of environments. For a full sound picture, Binaural Spatial Processing provides the experience of natural listening capturing sounds binaurally – binaural, meaning both ears. North offers a 101-decibel dynamic range, which gives wearers the experience of natural sound without distortion. Beyond speech recognition and environmental sounds, North takes better hearing a step further. Music lovers will appreciate My Music, designed to capture the intricacies of frequencies in music. In terms of sound frequencies, Frequency Compression balances high and low frequencies for a more balanced experience. 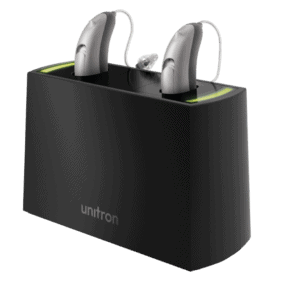 The North Platform is at the center of Unitron’s hearing aids and can be found in newer models. Unitron’s Moxi family of hearing aids has received a number of accolades for design and innovation, with Red Dot Design awards in 2014, 2015, and 2016. Moxi hearing aids are receiver-in-canal aids, and come in a number of models such as Fit, Kiss, and Dura. Moxi Now is the newest model in the Moxi family of hearing aids. 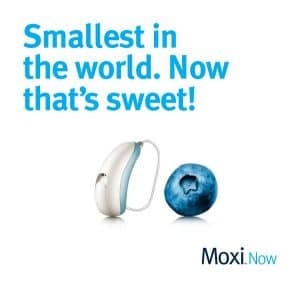 Moxi Now is the smallest receiver-in-canal hearing aid available on the market, the size of two blueberries stacked on top of one another. Though small in size, Now is an incredibly powerful aid, available in three technology levels (700, 800, and Pro), with 16 to 20 channels. All Moxi Now aids are powered by the North Platform, offering the above features. Depending on the level, Moxi Now aids provide wearers with Speech Zone 2, binaural spatial processing, SoundNav, Sound Conductor, MyMusic, Binaural Phone (a wireless phone option), Automatic Adaptation Manager, and AntiShock (which ensures comfort in light of sharp, sudden sounds). Stride and Max hearing aids are both powered by the North Platform. Stride is a family of aids available as behind-the-ear and in-the-ear, providing excellent speech recognition and flexibility in different noise environments. Stride provides all of the features of the North Platform, as outlined above. Unitron offers the Max hearing aid for people who experience higher degrees of hearing loss. Max is a super-powered hearing aid, worn behind-the-ear. As an advanced aid, Max provides higher levels of speech intelligibility and a long battery life. Max is available in three technology levels to address the different needs of severe to profound hearing loss. Unitron is committed to ensuring the best fit for their clients. With TrueFit Software, all of your preferences and changes are logged. The data saved provides your hearing specialist with insight into your listening needs, which helps with more in-depth customization and personalization. For people who are new to hearing aids, and even for those who are veteran aid wearers, this information is crucial to ensuring the best hearing treatment. In conjunction with TrueFit, the Flex program allows wearers to “test drive” Unitron hearing aids. According to surveys, 84% of Flex customers believe that the trial experience improves their own experience with hearing aids, and 82% of Flex customers report that the trial period helps to fit higher technology levels to hearing needs. To get started with Unitron hearing aids, contact us at Bay Area Hearing Service today.